Temperare , in Latin means to proportionately mix colors so that the mixture can be used for painting. New most complex wine in the series of Classics at the same time aspire to the title of the best wine of IURIS winery. This wine blend is, in a way, a ‘collision’ between the West and the East because four grapes, two European: cabernet sauvignon and merlot and two local grapes: vranac and plavac mali, coexist in it, talk to each other and sing in unison. This blend – unlike their other blends of the Cyclists series, goes a step further, which makes it clear in the very name of wine (Premium Cuvée). Pairing the highest quality grapes of four varieties of sunny Dalmatia (Ravni Kotari in Zadar inland region - very irony red soil - and island of Brač with its high altitude vineyards open to the sun) is a fine piece of work, but real wine connoisseurs delight over Tempera’s is in potential that it carrie. Aging will show the true value of Tempera. You can be sure it will darken with depth developed by aging and mature, giving a luxurious and complex wine that you will remember. 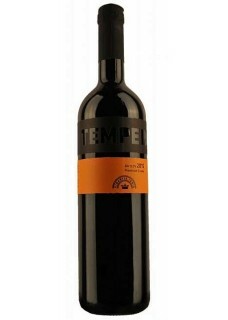 Tempera blends Cabernet sauvignon, Merlot, Vranac and Plavac mali. IURIS winery uses the traditional method of maceration in old oak barrels of 500 liters and afterwards, the wine is aged in oak barrels of 225 and 500 liters for at least 12 months.